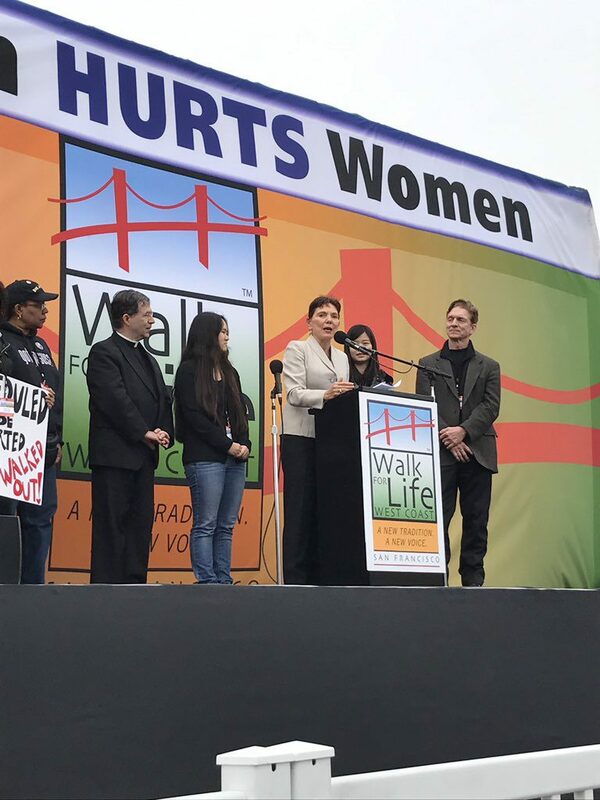 WRWF President Reggie Littlejohn was a keynote speaker at the West Coast Walk for Life in San Francisco last month, which was attended by an estimated 50,000 people. Littlejohn stated, “I am grateful to Eva Muntean and Dolores Meehan for caring about the women and babies of China, who are still undergoing forced abortion and sterilizations under the new Two-Child Policy. I am also grateful for the opportunity to surprise my daughter, Anni, with a memorable birthday gift!” Littlejohn invited the entire crowd to join her in singing Happy Birthday to Anni, whose birthday was the day after the Walk. Reggie addresses 50,000 at the West Coast Walk for Life, flanked by husband Rob, daughters Anni and Ruli Zhang, Fr. Frank Pavone, President of Priests for LIfe, and Lori Hoye, Co-Head of the Issues4Life Foundation. Littlejohn pointed out that Anni was born on January 22, 2003, the thirtieth anniversary of the Roe v. Wade decision, now Celebration of Life Day. “I believe that Anni symbolizes all the beauty, brilliance and love of Chinese girls, every one of whom deserves to draw breath on this earth.” Littlejohn and others rescued Anni and her sister Ruli from China three years ago. Littlejohn and her husband are now raising Anni as their own daughter. Once in America, Littlejohn discovered that Anni has an amazing talent playing piano. Anni won an international contest and performed piano in Carnegie Hall just before Christmas, 2016. She had only been playing three years. Women’s Rights Without Frontiers will host a panel at the United Nations Commission on the Status of Women (UNCSW). The event, entitled, “Femicide, Trafficking, & Reproductive Violence Against Women & Girls,” will take place Thursday, March 23, from 2:30 to 4:00 p.m. at the United Nations Church Center in New York (details below). The event is open to the public and does not require pre-registration. The event will take place on the10th Floor of the United Nations Church Center, 777 United Nations Plaza, New York, NY 10017-3521. Once on the 10th Floor, participants will be directed to the room. March 8 is International Women’s Day. Women’s Rights Without Frontiers presents the heartwrenching testimony of Yue Zhang, who suffered a late-term forced abortion under China’s One Child Policy in 2013, because she was unmarried. It remains illegal under China’s Two Child Policy for unmarried women to give birth. We give special thanks to Women’s Rights in China for connecting us with Ms. Zhang, and to The Heritage Foundation for hosting an event to shine a light on continuing coercion under China’s Two-Child Policy. My name is Yue Zhang, I was born in Nanjing City in China’s Jiangsu Province in 1985. First, I would like to thank Women’s Rights Without Frontiers (WRWF) for inviting me to speak, and the introduction from Women’s Rights in China (WRIC). I would also like to thank The Heritage Foundation for giving me the opportunity to stand here and tell my tragic experience of forced abortion by Chinese health and family planning officials. It used to be a memory that I was most reluctant to look back at, and even regarded it as extremely shameful. But today I understand that the victim must be brave enough to stand up and tell the truth, and show the world that the Chinese Communist Party’s family planning policy continues to murder, fine and persecute women. Even though the Chinese Communists have modified the policy, the act of harming the women and destroying lives is still continuing to happen. At the end of August, 2013, I felt nauseous and uncomfortable. I thought I was sick and went to the hospital for a check-up. The doctor told me that I was pregnant. Upon hearing this news, I at first felt surprised and happy — I was at the proper age and always had dreamed of becoming a mother. Every time I saw friends and classmates together with their child, I admired them and wanted to have a child of my own. After the initial excitement, I was also felt worried and frustrated, because I was not married. Moreover, I had separated from my boyfriend before I found out I was pregnant. In China, it is against the family planning policy for unmarried women to give birth to their child. I was worried for the future of my child, worried that he or she couldn’t obtain Hukou (household registration). A child without Hukou is unable to go to school, unable to receive education, and unable to have the rights to get various vaccinations in hospital. That child will also have many difficulties building family and career in the future. Although I had these concerns, my right to become a mother and my desire to protect lives allowed me to continue the pregnancy of my child. I felt happy every time the little baby moved in my womb. Around 5 months into my pregnancy, the government’s Family Planning Committee found that [that I was pregnant]. One day the neighborhood Committee waited outside my house along with Family Planning Officials. In the beginning they were beat around the bush, but pretty soon they disclosed the real purpose of the visit: to persuade me that, in my situation, I had to either perform abortion or pay a large “social maintenance fee.” After that, they left my house to let me think through my options. I decided to continue my pregnancy with this child. One day in early March in 2014, when I was six months pregnant, our community street Family Planning Officials suddenly broke into my house, telling me my two only options: First is forced abortion, Second is paying the social maintenance fee. Otherwise, if the child is born, without Hukou, he will not be able to do anything. They also threatened to inform the bank to confiscate my house, telling my employer to fire me and leave me unemployed. I felt anguish — I couldn’t choose either option. After the officials left, I immediately inquired about the Family Planning Policy and Social Maintenance Fee policy of Jiangsu Province. I learned that with my annual income level, in order for my child to get Hukou, I needed to pay over sixty thousand US dollars of “Social Maintenance Fee,”or penalty. After paying the penalty, one could get the Hukou with the receipt [of the penalty fee] at the local police station. I simply couldn’t afford this huge cost. According to the “Jiangsu Province Population and Family Planning Ordinance” Chapter 6, Article 41, specific standards [setting the amount of the social maintenance fee], “for those who give birth outside of wedlock, the first child will be charged for 0.5 times to 2 times of the amount of the basic standard of Social Maintenance Fee. The urban residents’ basic standard is the previous year’s average annual income of the county where the individual lives. For those whose annual income is more than twice of the average urban or rural residents’ annual income, in addition to the fee mentioned in Paragraph 3 of this article, the individual shall be charged a fee of the equivalent of one or two times of the extra portion of the individual’s annual income.” In 2013, the average income for Nanjing City’s residents was 39,881 Yuan. Unfortunately, 2013 was the year in which I had the highest annual income since I started working. That year the market conditions were favorable and my sales number was high, therefore I had the highest bonus amount. With my annual income of approximately thirty thousand US dollars, I would have to pay an equivalent of sixty thousand US dollars of social maintenance fee. But this is not an annual thing [that I got such a high income]. Moreover, I had already consumed most of the money that I earned and sometimes I even had to borrow money from bank to pay for some larger costs during daily life. But I never wanted to give up on an innocent little life. My mother also could not bear to see this happening. My poor mom asked around for help and information. She finally told me that, by the time I would give birth, we could bribe the doctor to help with the birth, and we could request a favor from the local police officers and get Hukou by paying some money. Finally, in mid-March of 2014, a group of six to seven people from the Family Planning Committee forced their way into my house. They sent two people to watch my house, and four others to drag and pull me into a car waiting at my door for a while. My helpless mother also followed me in the car to the hospital. In the hospital, on the same afternoon, the doctor injected a need of oxytocin into my abdomen. I was trembling. I kept shouting and struggling. The doctor left after the needle injection. After a few hours of stomach pain, I started to see blood and liquid flow. In the evening, I had strong stomach pain, and after another few hours, I first saw the water capsule, and then the child came out. I dared not open my eyes to see [the child]. A lively, fresh life just silently got destroyed like this. I cried and roared. Doctors and nurses took away the little life. I wanted to beg them to leave it with me, but I couldn’t speak. Afterwards, the doctor gave me another shot, saying that it was to stop the pain, but the pain did not stop. When they performed the operation to clean my womb, it was so unbelievably painful. Lying on that bed, I felt my body was cut open and broken. I kept crying. The child was still so small — didn’t open the eyes and have a chance to come to this world and call me “Mom,” didn’t even make a sound of crying, and just get deprived of life by the government. My mind and body suffered great harm, but my boyfriend who was in love with me for many years didn’t even come to look at me and give my any comfort. In the traditional Chinese culture and the backward ideas, this experience would be considered very shameful. Pregnancy outside of wedlock not only violated the country’s law, but also indicated that I was not a decent girl. Some people even describe the womb of people like me as the“house where people have died, meaning, who would want to live in a house where people had died? These people believe that it would be unlucky to marry someone like me and it would be hard to gt pregnant. Therefore, I dared not tell anyone. I was having hallucinations and for awhile always seem to hear children crying around me. Sometimes I believed it was my fault. I hated myself for getting pregnant without getting married, and causing my child to die. Physical and psychological pain for a while has made me want to stop living this life. Here I would like to thank my mother. She accompanied me through the most desperate days. She tried many ways to enlighten and comfort me, encouraging me to travel and study. With my mother’s encouragement and help, in December of 2014 I came to the United States. As a stranger in this country, I felt the culture of an open society. I felt the air of freedom, democracy and human rights. All this gave me the courage to sail on with my life. In May of 2015, I applied into a Language school in New York City, to enhance my English communication skills. I remember that, soon after I went to the language school, once we discussed the family and marriage in class, a classmate asked me “I heard that in China, you can’t have multiple children, is this true?” After listening to my explanation of the Chinese Family Planning policy, they all were surprised, and directly told me that, “if the government dared to tell me how many children I could have, or did not allow my child to be born, I would use a gun.” It was at that time, I realized that this was not my fault. In fact my child also had the right to come into this world. On the contrary, it was the Chinese government’s fault. China’s Family Planning Policy persecuted me and violated my legal rights. Reading some online articles from the Women’s Rights in China (WRIC) Chinese website about Chinese family planning, I was very much enlightened. In December of 2015, I took the initiative to join the volunteer team of Chinese women’s rights. During the interaction with other volunteers, what I learned and heard completely changed my view from my education in China. I saw things that I couldn’t see in China. I learned that it is a basic human right to give birth to child, and forced abortion is an inhumane action of murder. I also learned about how to make my voice heard for myself and for others’ rights. Most importantly, I realized that all of this is not my fault, but is because of the serious human rights violations by the Chinese government for a long time. It is not us who should feel ashamed. It is the government that represents Chinese Communist Party that should feel ashamed. We have to stand up when our legal rights are violated, share our experiences, and reveal the murderous nature of the Chinese Family Planning Policy. I am here today not only for myself, but also representing millions of Chinese women, who till this day still cannot make decisions about their own body and their own womb. In today’s China, it is not just me who suffered from the Family Planning Policy. Another forced sterilization just happened. On February 8, 2017, in Yunnan Province’s ZhaoTong City, resident Hu Zheng Gao and his ex-wife have three children. His ex-wife was forcibly sterilized for violating the Family Planning Policy, and paid a huge sum for the Social Maintenance Fee. Hu Zhenggao remarried in 2013, and his wife gave birth to another child. Surprisingly after 17 years, he got arrested by local Family Planning Officials when visiting home for Lunar New Year. They were detained till 2:00 a.m., and the local government officials threatened him with two options. The first option was to get sterilized immediately. The second option was to be jailed for 15 days together with his wife for disturbing public order. Eventually he had anesthetic medicine applied and was forced to the Family Planning Office of the township government and was performed sterilization operation. His wife remained detained in the police station where he was sterilized. Countless bloody facts are telling us that China’s inhumane murderous family planning policy is still in progress and is continuing to persecute women and families. The Chinese government formally adopted the Two-Child Policy on December 27, 2015, and formally implemented it on January 1, 2016. Many people believe that this will mean a fundamental change to China’s Family Planning Policy, but this is not true. After implementing the Two-Child Policy, there was not a corresponding policy regarding women’s occupation, maternity leave, healthcare or education. Using healthcare as an example, there is a serious deficiency in the number of gynecological doctors and pediatricians. According to official data from the proceedings of China’s Family Planning Committee on September 27, 2016, the mortality rates for the first half of 2016 for pregnant women and new mothers have increased by 30.6% compared with same period in 2015. In other words, the steep rise in mortality rates indicates that the lives of Chinese women are not respected or receiving enough attention, no matter whether it’s a One-Child or Two-Child policy. The Chinese government created a wrong policy for its own interests, arbitrarily violated women’s legal rights, and deceived the Chinese people for a long time. There are millions more women, most of whom are not as lucky as I am, since I can come to the United States and access a completely different culture, access democracy and freedom. These women are still living in guilt and self blame, unaware of their legal rights. They are struggling to have one more child, suffering all kinds of persecution without being able to appeal for justice. Because of this, I choose to stand up, and I have founds that many people from China are sharing the same belief and voice as mine. I believe one day, Chinese women can really become the owners of their own bodies, control their own right to give birth, and no longer bear the burden of family planning policies. Their bodies will no longer be harmed by the government. They will live their lives with dignity. Women’s Rights Without Frontiers is a broad-based, international coalition that opposes forced abortion and sexual slavery in China. Our immediate goal is to raise public awareness regarding the coercive enforcement of China’s One Child Policy, the connection between this coercion and human trafficking in Asia, and the other human rights abuses that arise out of this coercive enforcement. Please click here to sign their petition or here to make a contribution to continue their fight against forced abortion!